Posted: Saturday, June 30, 2018. 8:27 am CST. 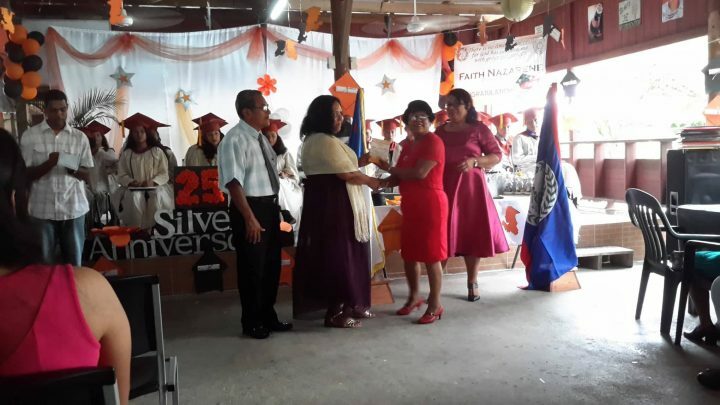 By BBN Staff: On Wednesday, June 27, 2018, founders of San Ignacio’s Faith Nazarene School John and Anita Tzib were recognized at the school’s silver jubilee (a celebration held to mark the 25th anniversary) for their contribution to the institution. San Ignacio’s Faith Nazarene School was established on September 6, 1993, and the school opened its doors to just over one hundred and sixty students and five trained teachers: Dorothy Garbutt, Susan Ortega, Yadira Simpson, Anita Tzib and John Tzib. Rev. Tzib also served as the first principal of the primary school. Special invited guest speaker at the event was Attorney Dr. Hector Guerra, a proud graduate of the school. Reverend John in his address shared a brief history of the primary school by highlighting the birth of the institution and the growth over the past 25 years. At the event, it was announced that for the first time, the school received countrywide recognition for their performance on the National Primary School Examinations. The school was rated in Category 2.